Employers have two options when considering this program for their workforce. They can book a “Get Skilled” program or they can book the “Get Certified” program. GET SKILLED = this program offers students the opportunity to participate in all the learning sessions together with activities, discussions and research to best develop their knowledge & skills in a Work Health Safety capacity. Assessments with feedback to reinforce your learning are optional. At the end of the program, participants will be issued with a Training Aid Australia GET SKILLED Certificate of Completion. 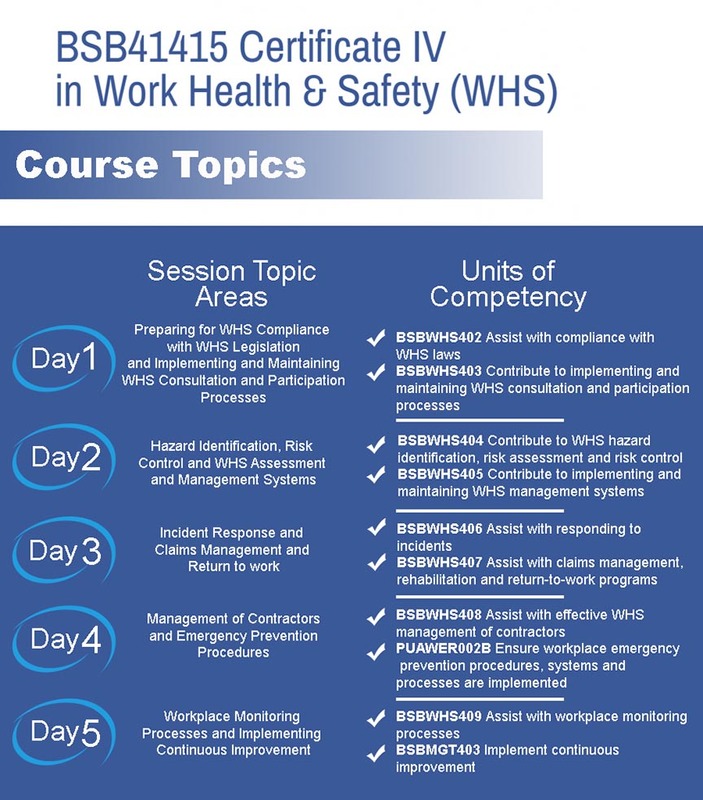 GET CERTIFIED = this program includes all the “GET SKILLED” components, then has added assessments for the opportunity to obtain an Australian Nationally Recognised Qualification – BSB41415 Certificate IV in Work Health & Safety (WHS). If you would like our program facilitators to come to your workplace and deliver Work Health Safety training for your work group, submit an enquiry for group training and one of our course advisors will be in contact to discuss what you want and to provide a quote. The below table covers some of the Work Health & Safety topics and subject specific areas we cover in the Sydney Work Health Safety training. We can cover any of the below topics plus many more, depending on your workplace needs. The beauty of our training offerings is that we can customise the training to cover the topics you need. Our program facilitators are familiar with many industries and can contextualise the training for your specific workplace. We prefer to use real workplace examples when reviewing current practices and policy. If you have a particular situation which you need expert advice on, we can provide this level of training and assistance. Employers can select any components from the below two GET SKILLED and GET CERTIFIED programs. The GET SKILLED program allows for complete customisation. You can opt for a half day session addressing one component or the fundamentals of risk assessment. You can go for a 2 day program packed with WHS content to really up-skill your workforce. Assessments are optional, workshops, group activities, scenarios, workplace specific problem solving, policy review and more are all available with the GET SKILLED program. The GET CERTIFIED program provides a pathway for your workforce to gain an Australian Nationally Recognised Qualification. It covers Australian Legislation and many of the fundamental components related to Workplace Safety. The program is suitable for businesses wanting to educate their staff and team to manage safety in the workplace. The program touches on policy development, committees, consultation, leadership, monitoring and a few other important topics to ensure the workplace is taking the right step towards a safer environment for their employees. the number of departments and size of the organisation, the more team members working on safe work practices the better. variety of contexts and may include coordinators, advisors and facilitators. This course requires that students have some foundational LLN skills. For full details, please refer to the Course Description PDF. Conveniently located, our training centre gives students access to a range of transport options.